Who should not take Provera? What conditions does Provera treat? Tell your doctor right away if any of these serious side effects occur: unusual vaginal bleeding (e.g., spotting, breakthrough bleeding), mental/mood changes (e.g., depression, memory loss), swelling of the hands/feet, frequent/burning/painful urination, breast lumps, dark patches on the skin or face (melasma), yellowing eyes/skin, unusual tiredness. List Provera side effects by likelihood and severity. This medication should not be used if you have certain medical conditions. Before using this medicine, consult your doctor or pharmacist if you have: history of blood clots, history of bleeding in the brain, liver disease, cancer of the breast or other female organs, vaginal bleeding of unknown cause, a loss of pregnancy with some tissue remaining in the uterus ("missed abortion"), recent stroke or heart attack (within 1 year). Before using this medication, tell your doctor or pharmacist your medical history, especially of: family medical history (especially breast lumps and cancer), kidney disease, obesity, heart disease (e.g., past heart attacks, coronary artery disease, congestive heart failure), high blood pressure, seizures, migraine headaches, asthma, high blood levels of cholesterol/fats, depression, diabetes, strokes. What should I know regarding pregnancy, nursing and administering Provera to children or the elderly? Does Provera interact with other medications? 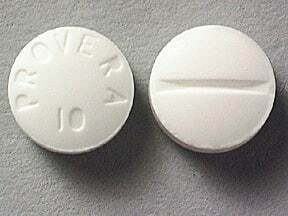 This medicine is a white, round, scored, tablet imprinted with "PROVERA 10". 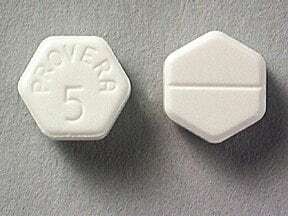 This medicine is a white, hexagonal, scored, tablet imprinted with "PROVERA 5". 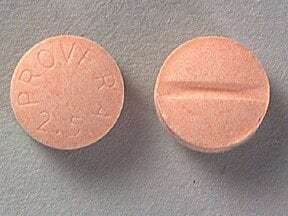 This medicine is a orange, round, scored, tablet imprinted with "PROVERA 2.5". Are you considering switching to Provera? How long have you been taking Provera?